HomeViolence – Futility – Violence – Futility . . .
Violence – Futility – Violence – Futility . . . When I was watching 60s war movies with my Dad as a little’n, I used to ask him why the Germans bothered with armies and stuff, when they could just blow up bombs in London and terrify the populace that way. He talked to me about “rules”. Later on, after I grew up a little, I thought that if The State (l’Etat?) guarantees more or less 100% security, then anyone who took even 1% off that, was defying the State’s authority and was thus undermining the other 99% of the State. In my mature(r) years, I have thought that if WE bomb THEM, then why can’t THEY bomb US? The product sold to us in the West of highly trained fighter jocks, 30,000 feet above the fray, dropping laser guided bombs on hapless and defenceless targets, who then die terrible deaths with their bloody, eviscerated intestines wrapped around the severed, eyeless, lipless heads of their children, was always false advertising. We sit in our fighter jets playing win-win video games. They arm themselves with Kalashnikovs and retaliate against our homeland. Yet the former is moral and surgical. The latter excites worldwide horror and revulsion. It’s not win-win anymore. The targets have learned how to be the aggressors. Can we really blame them for retaliating in the best way they know how?Can we condemn them for bringing home to us, in our supposedly secure cities, just what it is like to have random murder perpetrated on our citizens and loved ones? I’m as horrified as the next person by what happened today. I’m revolted and disgusted about Paris. But can I blame “the enemy” for giving back to “us” some of what we have done to “them”? In my heart of hearts, I can’t. I hate it, but you can’t say we weren’t warned of the consequences of our actions. Can someone tell me I’m wrong? And if I am, where I’m wrong? You are right, and I agree with everything you say. It has attracted quite a bit of ‘how dare you say this right now’ comment. But it is absolutely right, and there is no ‘good’ time to point out how hypocritical we are, weeping over one outrage and ignoring another, just as horrifying, because those killed or injured are not white, or European, or Australian. Does anyone truly believe that violence can lead the world to a better place? There can be only one reason for the attacks in Paris and that is to draw the West into increased military action in the Middle East, and from the sounds of it, that has been the call from many people today. To those whose answer to the bombs and bullets is bigger bombs and more bullets, I would say you are being manipulated in the same way as the ignorant deluded handful of people who carried out these attacks. How can you claim to be on the side of right when you use the same methods – go to a foreign country and kill innocent people? How can you speak of national security and protecting your borders as you invade other countries? How can you claim to be protecting human rights as you bomb hospitals? How can you claim to be fighting for freedom as you lock up the people fleeing from oppression? We have removed countless despots and dictators but rarely has it gone well. We install corrupt governments or leave when it becomes politically inconvenient to stay and leave people to cope with the mess we leave behind. We train and arm paramilitary groups and then abandon them and show surprise when they team up with others we don’t care for. The armaments industry is a huge global business with no ethics. Defence forces are empire builders who demand hundreds of billions to ‘keep us safe’ as they spark aggression around the world. If you kill people, others will want revenge. Where does it stop? Is humanity capable of civilisation? Capable of tolerance? Capable of accepting the responsibility of caring for and nurturing all children, educating them, and protecting the environment so they can have a future? Billy Connelly used to do a skit about his mother belting him for hitting his sister. Are we to respond to violence with violence and see ourselves as saviours? Until we learn to respect each other and the planet we share, we are doomed to let those who would use us for their own power and profit pull the strings. Daech is the richest terrorist organization in history and has managed to build financial independence. His assets are estimated at 2260 billion euros and budget 2015-2600000000 euros. All details about the “economy” of the self-styled Islamic State. No wonder Turnbull and his tame Chief Scientist want to change the way university research is funding because they want commercial outcomes. You might remember this, a few days ago. Well, here’s an example of research findings published in an ‘obscure’ journal, the Australian Journal of Earth Sciences, that may well put an end to all plans for mining on the Liverpool Plains. A major commercial mining development killed off by research – not what Turnbull or the NSW government want at all. Change the way research is funded and studies like this could be done away with completely. It seems mining companies – overseas companies who do not have to deal with the aftermath of their operations here – can present their own Mickey Mouse studies to our governments, state and federal, and they will be accepted without question and without any need for an extra independent study. The only way independent studies can be done is through university research and that requires government funding. You can see where this is going. Governments who see quick financial gains in allowing mining in unsuitable areas can just refuse to fund any inconvenient studies that might kill off a mining proposal, or delay funding for years. An extra twist is cutting the numbers of government staff who investigate the environmental impact statements prepared by developers. That is what almost happened here, but somehow funding finally arrived, a long-delayed study was begun – more finding is needed for completion – and the findings are not good news for Shenhua. Will the NSW government take any notice? It’s up to the Baird government now to decide what will happen to the Liverpool Plains. I’m expecting the worst, and I don’t believe Labor would have been any different had they still been in government. It was a NSW Labor government that started this mess by granting the exploration licence in 2008. The then government was too greedy to refuse the $300 million Shenhua offered or the other bribes Shenhua proposed. Farmers were also greedy, greedy for the money they received by selling their farms to Shenhua. Both Labor and Coalition governments are greedy for revenue from coal mining and coal seam gas. They see only the short-term budget fix, not the long-term destruction of land and food security. Too many prominent Labor and Coalition MPs rush to join mining companies when they retire from politics, greedy for the salaries and board member fees they are paid in their ‘retirement’. They are so greedy they are willing to become traitors, using their influence to push the ‘advantages’ of mining at the public. Mining carried out by foreign-owned companies with all profits flowing out of this country. It’s all about greed and hang the consequences. A bit more on mining and food security. The landowners provided masses of expert evidence, including an inch-thick geo-tech report predicting serious interference with the water table. Hume offered none. The commissioner found against the landowners on every front. 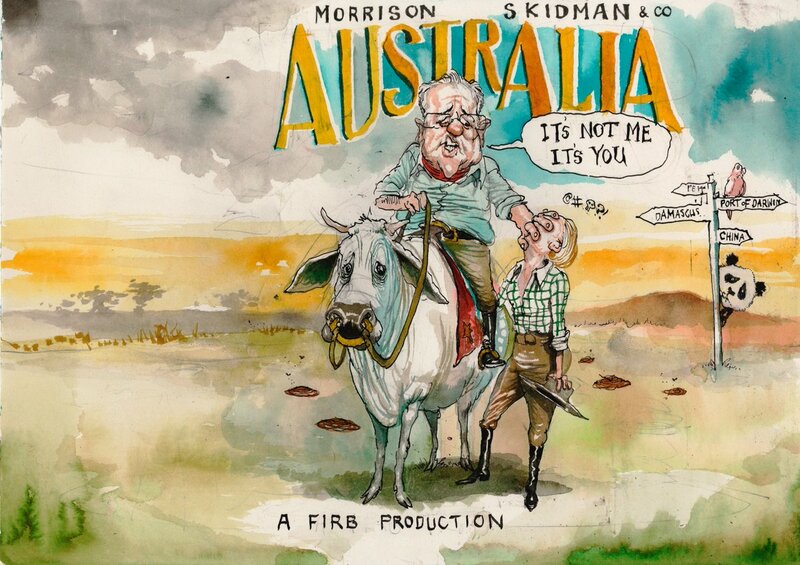 Treasurer Scott Morrison says the government will block the sale of Australia’s largest cattle property portfolio, S. Kidman & Co, to foreign buyers. Rumours of a potential buyer have been circulating for months, but the Kidman family and the deal’s facilitators, Ernst and Young in Adelaide have remained tight-lipped about the negotiations. The ABC understands eight bidders were shortlisted, both Australian and international. It’s been reported that a bidding war above $350 million has been playing out between China’s Genius Link Group and fellow Chinese company Shanghai Pengxin for the vast cattle enterprise. I think that cartoon linked by leone just now captures the Turnbull Effect very well, & the problem it presents for his political opponents. The drawing’s caught what I see in his presentations, the impression of a towering intellect, already having considered every aspect of the problem at hand & way ahead of anybody else, now dispassionately & eloquently summing up the only possible course ahead which naturally requires his stewardship. He’s actually said & proposed almost nothing but it sure looks good. Turnbull has done nothing but waffle about Syria. Every day there are reports of the latest thought bubble, none of them offer any answers or any commitment. 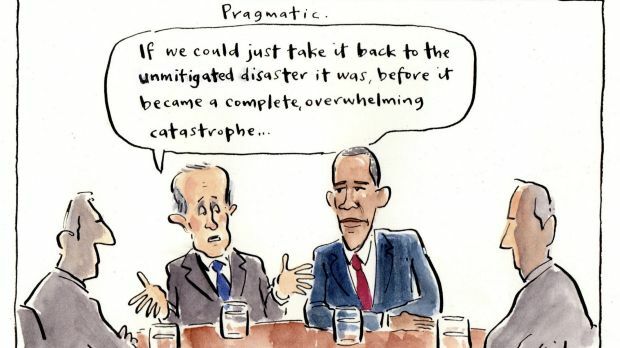 Turnbull is just flapping in the breeze, debating with himself, agreeing with Obama one day, proposing something different the next, going back to agreeing with Obama the day after that. The MSM report it all as a new sort of Gospel of St Malcolm, without question and without realising he is just repeating the same thought cycle – political solution….shoulder to shoulder with the US…..compromise ……over and over again. Meanwhile Julie Bishop minces around in her latest Armani outfit and silly stiletto heels, saying Australia will be happy to send more troops if the US asks nicely. So who do we believe. Turnbull and his flowery, vacillating wafflings or Bishop and her crazed war mongering? It’s not just fairfax hacks who have started writing Turnbull fan fics. Kristina Keneally gets it, why can’t others. I don’t think I want to waste time reading Barry Cassidy’s love odes. He’s just sucking up because he wants more ‘exclusive’ interviews with Turnbull. Write something critical and His Saintedness will refuse to come on your tacky little TV show. The Liberals make a namby-pampy wimp PM and just look what happens! Bring back Tony! Only Tony can Stop the Boats! A suspected asylum seeker boat has made it near Flying Fish Cove on Christmas Island before being intercepted by the Australian Navy. Locals on the island told SBS WA Correspondent Ryan Emery, who is on Christmas Island, that it was the first time such a boat had made it that close since 2013. I would love to think that Smith Point was named after my parents . . .
Tony Wright is having some fun at Turnbull’s expense. Cassidy is just another Richo but not as smart. “Pray for Paris” – a phrase born out of the tragic terror attacks in the capital city on Friday – has moved from mournful posts on social media and into the world of merchandise. The saying, as well as as a drawing by French graphic designer Jean Jullien, can now be found on mugs, stickers and tank tops, raising questions about how much mainly online retailers are profiting from the loss of 129 people. Turnbull later sought to further ease concerns by telling Darwin radio station Mix 104.9 the port was not used by military. “The port that is being leased is not used by the military right, it is a commercial port and that’s the fact … so I guess that’s really the key point,” he said.